Coral is an integral part of the European gambling conglomerate Gala Coral Group, which – through Coral and its other brands – focuses on the UK and Italian gambling markets. Coral itself is the third largest retail bookmaker in the UK and enjoys a market share of some 20% through its 1700+ estate of bricks-and-mortar shops. Their interactive division covers its online, telephone and mobile operations, and their website has been live for over a decade at the time of writing. 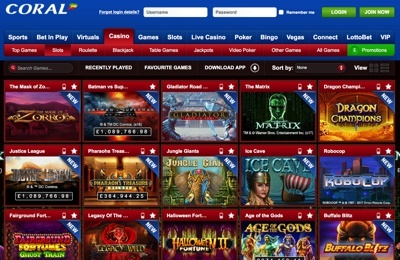 That website – coral.co.uk – is operated by Gala Interactive (Gibraltar) Limited (one of Gala Coral Group’s other businesses) and its subsidiary Coral Interactive (Gibraltar) Limited, who are, as you might guess by the company names, based in Gibraltar, licensed by the Government of Gibraltar and regulated by the Gibraltar Gambling Commissioner. Despite being based in Gibraltar, because much of Coral’s custom comes from the UK market, they are required to adhere to the United Kingdom Gambling Act 2005, which, among other things, aims to ensure that gambling is conducted in a fair and open way, a sentiment Coral fully embrace. With a strong focus on sports betting, Coral offers a highly effective sportsbook that covers an extensive variety of sports and a vast range of markets. 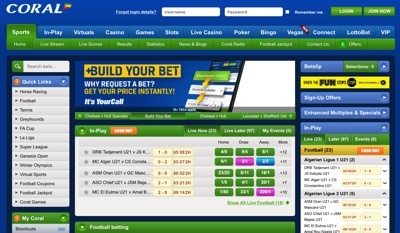 They offer in-play betting on many sports, with football their most regular offering, and the sportsbook is also available on any mobile devices that incorporate a browser simply by typing in the usual URL. Aside from the sportsbook, Coral offer casino, live casino, games, poker and bingo products, so they are as wide-ranging as any of their rivals. At present only the games – along with the aforementioned sportsbook – is available on mobile devices, but other products are likely to be added in the future. So while Coral is predominantly known as a sports betting company, they have embraced, and seemingly excelled, in other areas of the gambling industry and offer customers an excellent choice of high-quality gaming products. The bookmaker at Coral is one of the best in the business with a great variety of betting options and a huge arrange of promotions available. The betting platform is easy-to-use and offers a live streaming section on horse racing, greyhounds, football, tennis, and more. There is also a live scores section for those times when you’re not supposed to be on your phone, but you need the latest update. As one of the most popular high street and online bookmakers around, Coral comes highly recommended. The casino itself at Coral runs on Playtech software and the games can either be played through your browser or via a desktop app. A limited number of games are also available to play on your mobile phone or tablet. 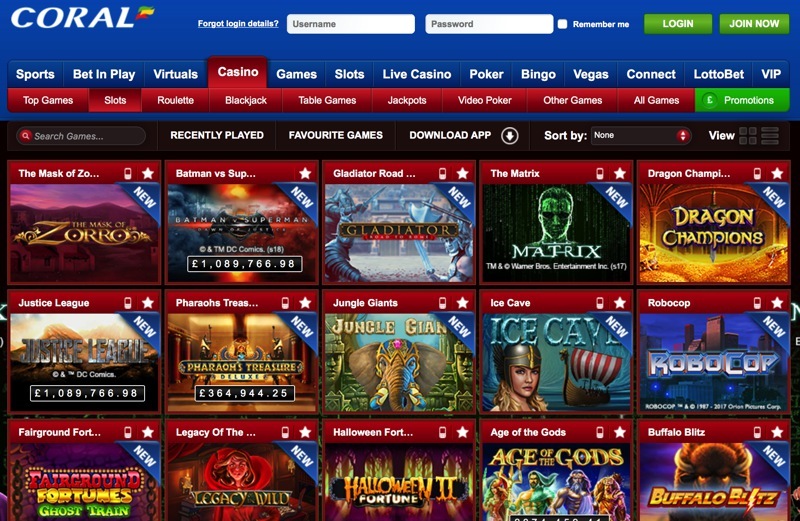 As well as the standard Playtech slots and games, they also offer slots from IGT in their ‘Games’ tab. For those of you who prefer your games dealt by live dealers, Coral’s live casino offers live dealer versions of Blackjack, Baccarat, Casino Holdem and Roulette. 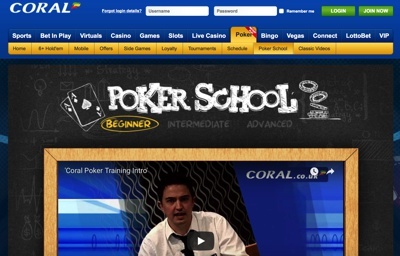 The Coral poker site runs on the Playtech operated iPoker network, having previous migrated from Ongame. It offers both cash games and tournaments in good old British Pounds, as well as euros and US dollars, of course! 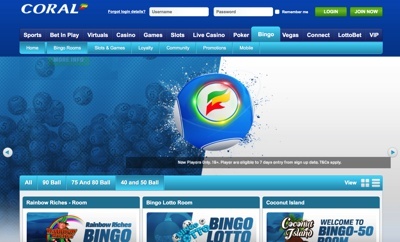 Coral’s bingo room also runs on a Playtech powered product – the Virtue Fusion bingo network. As one of the most popular and active networks, it offers round the clock games with huge jackpots waiting to be won. There are, of course, plenty of offers to be had at Coral bingo from free daily scratchcards to big money bingo games, escalator jackpots and bingo bonuses. These offers change frequently, so check out the official Coral website to see what’s currently up for grabs.